The classic lava lamp design is back, seen here in an eye-popping yellow and purple combo. Lavalicious! The enduring popularity of the bubbling LAVA® brand lava light shines on in this classic retro lamp. Features purple liquid with hypnotic yellow lava motion. Wax and liquid inside the glass is heated by a bulb in lower lamp section that heats a coil. The coil heats the wax that creates the oozing, mesmerizing motion. 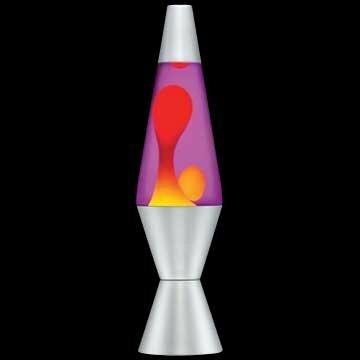 An official, authentic Lava brand lamp; Silver finish base, purple liquid, yellow lava. 20-ounce size; 14.5", classic motion-style light; Includes one 25 watt appliance bulb. If liquid is cloudy, run for extended time to return to normal. Avoid jostling the lamp which can cause wax to break-up. If you have any questions about this product by Original Brand Lava Lamp, contact us by completing and submitting the form below. If you are looking for a specif part number, please include it with your message.